More than 4,000 Martian days after NASA's Mars rover Opportunity began exploring the surface of the red planet, the little robot caught sight some something truly stunning. 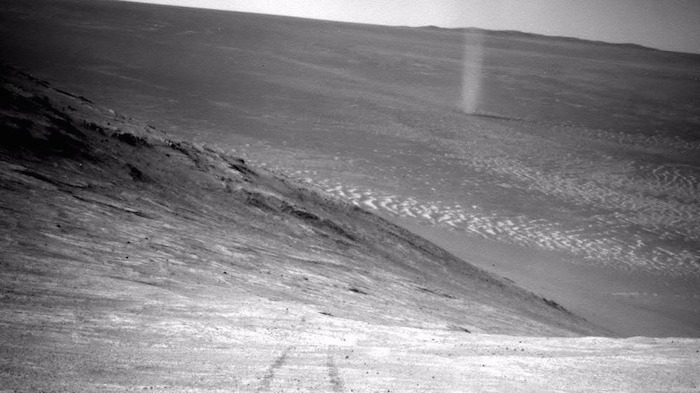 Opportunity snapped a photo of a dust devil swirling in the Meridiani Planun, the rover's home since it landed on the planet in 2004. "This is one of the best dust devils that we have seen in Meridiani Planum," Ray Arvidson, Opportunity's deputy principal investigator, confirmed to Mashable via email. "We are lucky to have captured this one in an image!" Scientists have known that dust devils kick up the Martian dirt on the red planet for years. In 2012, the Mars Reconnaissance Orbiter actually caught sight of a 12-mile-high dust devil with its plume stretching to the sky. Dust devils on Mars and dust devils on Earth form in similar ways even though Mars' atmosphere is incredibly thin by comparison. The devils form when, on a dry day, part of the ground heats up more than the surrounding area, according to NASA. It's pretty rare for Opportunity to catch a dust devil in the act, Arvidson said, but when its twin rover Spirit was still functioning, that rover saw plenty of devils in its day. 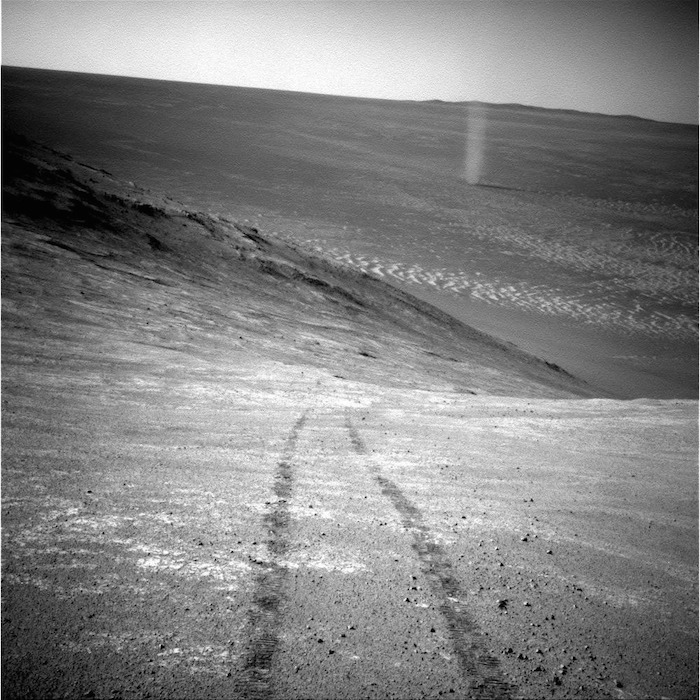 "We have seen many dust devils while the Spirit rover was still operating in Gusev Crater," Arvidson said. "In contrast these are rare events at the Meridiani site." Opportunity is still healthy and exploring Mars. The rover recently attempted to navigate up the "steepest slope ever tackled by any Mars rover," according to NASA, but it didn't quite make it to the top. Opportunity's wheels slipped too much, so scientists decided to give the rover an easier path to its next target area of exploration.